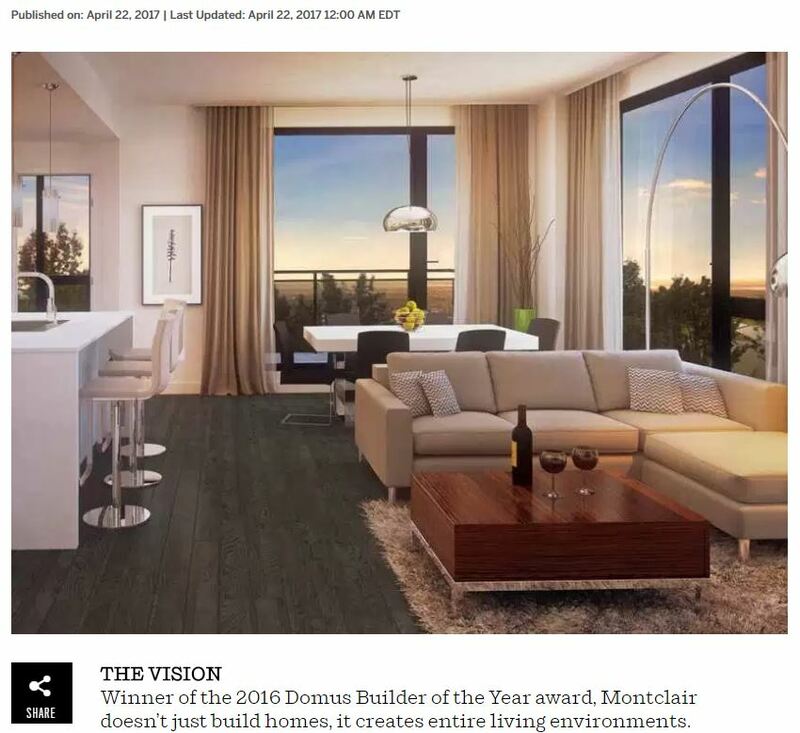 Winner of the 2016 Domus Builder of the Year award, Montclair doesn’t just build homes, it creates entire living environments. 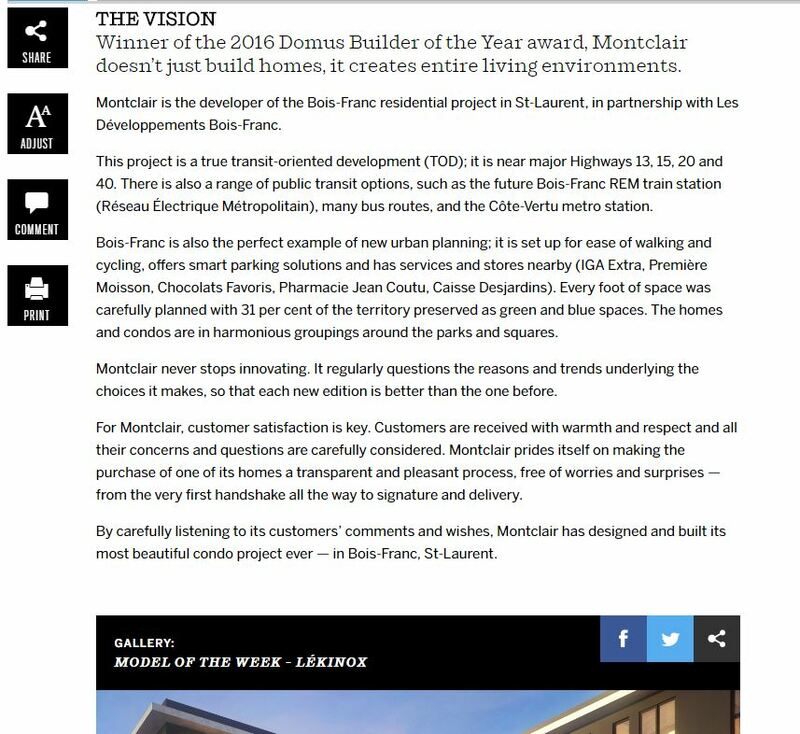 Montclair is the developer of the Bois-Franc residential project in St-Laurent, in partnership with Les Développements Bois-Franc. This project is a true transit-oriented development (TOD); it is near major Highways 13, 15, 20 and 40. There is also a range of public transit options, such as the future Bois-Franc REM train station (Réseau Électrique Métropolitain), many bus routes, and the Côte-Vertu metro station. Bois-Franc is also the perfect example of new urban planning; it is set up for ease of walking and cycling, offers smart parking solutions and has services and stores nearby (IGA Extra, Première Moisson, Chocolats Favoris, Pharmacie Jean Coutu, Caisse Desjardins). Every foot of space was carefully planned with 31 per cent of the territory preserved as green and blue spaces. The homes and condos are in harmonious groupings around the parks and squares. Montclair never stops innovating. It regularly questions the reasons and trends underlying the choices it makes, so that each new edition is better than the one before. For Montclair, customer satisfaction is key. Customers are received with warmth and respect and all their concerns and questions are carefully considered. Montclair prides itself on making the purchase of one of its homes a transparent and pleasant process, free of worries and surprises — from the very first handshake all the way to signature and delivery. By carefully listening to its customers’ comments and wishes, Montclair has designed and built its most beautiful condo project ever — in Bois-Franc, St-Laurent. Lékinox Condos are surrounded by thousands of square feet of green space for your pleasure. There is also a gorgeously landscaped 4,400-square-foot backyard with stone walkways and surfaces, a water-jet fountain, lounge areas and gardening plots. 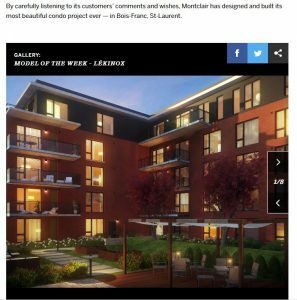 Our Lékinox units were designed to provide residents with spacious, comfortable and inviting living spaces, inside and out. 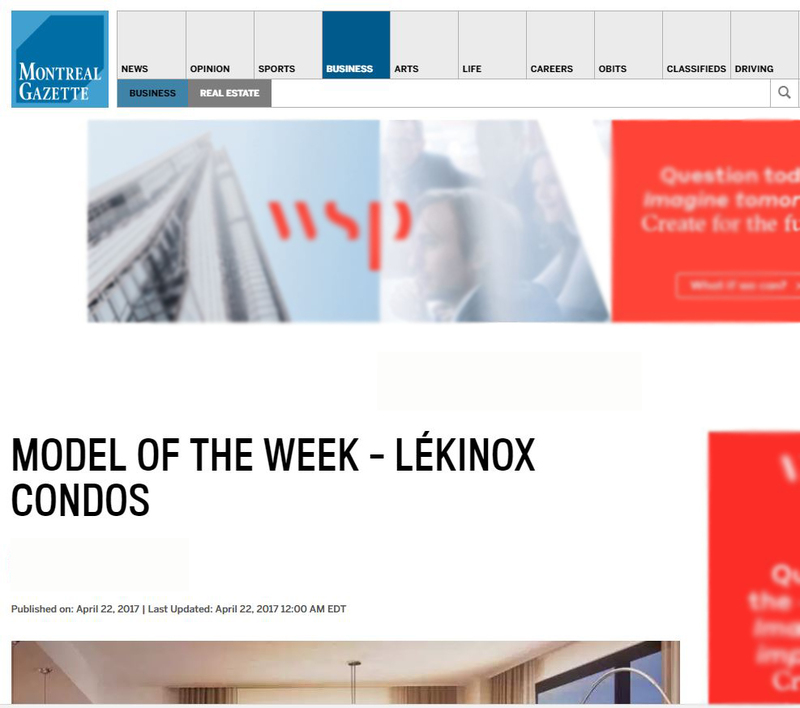 Lékinox also boasts a prestigious lobby, indoor parking with storage spaces, and fitness centre with view of the superb yard and garden. 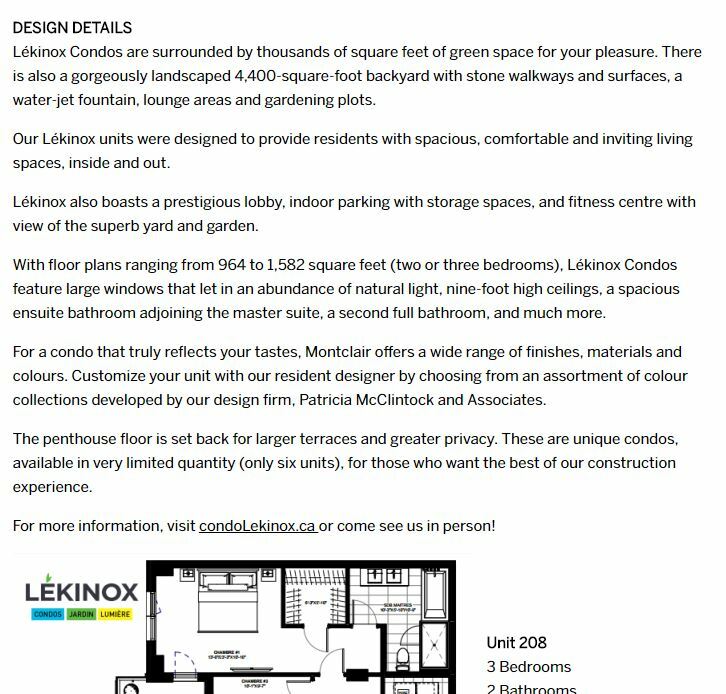 With floor plans ranging from 964 to 1,582 square feet (two or three bedrooms), Lékinox Condos feature large windows that let in an abundance of natural light, nine-foot high ceilings, a spacious ensuite bathroom adjoining the master suite, a second full bathroom, and much more. 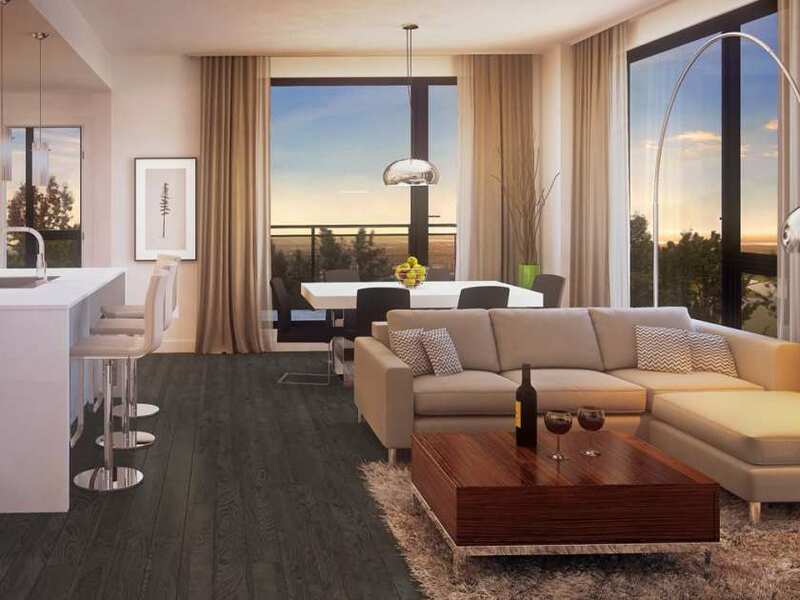 For a condo that truly reflects your tastes, Montclair offers a wide range of finishes, materials and colours. Customize your unit with our resident designer by choosing from an assortment of colour collections developed by our design firm, Patricia McClintock and Associates. The penthouse floor is set back for larger terraces and greater privacy. These are unique condos, available in very limited quantity (only six units), for those who want the best of our construction experience. For more information, visit condoLekinox.ca or come see us in person!